After we bade a fond farewell to Slovenia at the charming Ljubljana airport, we flew to Zurich by way of Paris. And in Paris we bid adieu to my sister and brother-in-law who were heading home to Pittsburgh via Reykjavik (you’d never guess, I bet, they flew Wow Airlines). I always hate to say goodbye to my sister, but they were ready to be home and see their dog (they arrived a week earlier than us and had visited England so had already been away three weeks). Anyway, we caught our flight to Zurich and arrived around 8:30pm – too late to do anything other than head to a hotel, which we did via Uber (easy and much cheaper than taxis in Zurich). Our hotel, the Ibis Zurich City West, was located in, well, I’ll call it hotel central, for lack of a better description. There were several hotels in the area, and all were oriented towards either the budget or business traveler. Or, in the case of the Ibis, a busload of Chinese tourists. It was actually pretty funny – just as we arrived they flooded the lobby and completely overwhelmed the hotel’s elevators. We headed over to the conveniently located hotel bar and had a glass of wine while we waited for the crowd to dissipate. One we made it to our room, we found it to be quite small but very efficient so all was good. The next morning we bugged out and headed to the train station to catch a train to Zermatt, the official start of our Switzerland trip. It was a 3 ¼ hour trip and our first-class Swiss Rail passes were successfully inaugurated. I immediately discovered the benefits of the first class pass – the second-class cars were pretty packed but there were plenty of seats in the first-class cars. I got a cup of coffee on the train and am now done with food and drink on Swiss trains. One tiny cup of regular coffee cost $4.16 francs (which is pretty much $4.16 US). We only had one transfer in Visp then it was on to Zermatt. We arrived around 1pm and hoofed it to our home for the next two nights, the Hotel Bristol. 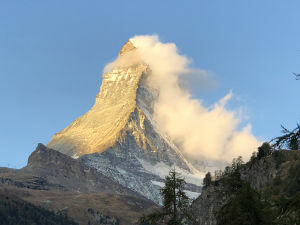 It was recommended to us by friends and turned out to be quite nice – we had a stunning view of the Matterhorn from our room, which, while not big was fine for us and had a very nice bathroom (always a plus). After dropping our bags off, we grabbed some lunch at an Italian place (Zermatt is very Italian – I didn’t realize how close it was to the border!) then decided to take a cog rail ride up to the Gornergrat, one of the peaks easily accessible from Zermatt. At just over 10,000 feet at the top you get a breathtaking panorama view of the area Including, you know, the Matterhorn). There were lots of trails all over the area, and after having a cup of hot cocoa at the café at the top, we decided to hike down to the next stop on the railway. In the literature they recommend you have sturdy hiking shoes. They could add an asterisk to that and add “and we specifically mean not your crappy Nike Free shoes, you nitwit” as that’s what I was wearing (but they were very light and easy to pack!). They were a really terrible choice. As we hiked down the trail I worried if my next step would result in a face plant or a sprained ankle. As we walked, I berated myself for the dumbass “how light can I pack” game I played on this trip. Sure, I got my bag down to 20 lbs but in my effort to pack light I left my lovely hiking shoes AND my running shoes AND my cozy poofy jacket AND my handy expandable suitcase at home. *sigh* Happily I survived the hike as did Chuck who had to put up with my alternating bitching about my shoes and my concern about falling on the trail. We rode the cog rail rest of the way back to Zermatt and had a lovely dinner at a restaurant near the hotel and crashed for the night after oohing and ahhing at the Matterhorn right outside our window (or so it seemed). 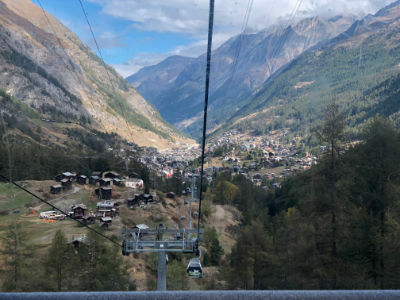 After a lovely breakfast buffet at the hotel, we decided to tackle a local hike out of Zermatt to Furi, a village about 2 ½ miles outside Zermatt and a stop on the Matterhorn Glacier Paradise cable car (okay, they call it a cable car, but I’d call it a gondola or ski lift). The hike was beautiful – all uphill but on a lovely trail that wound its way through a few tiny hamlets and pastures with cows and sheep. It took us about an hour of pretty strenuous hiking to reach Furi and by the time we arrived my knee was complaining big time. And it finally dawned on me what was going on. Since my mid/late 20’s I’ve suffered from chondromalacia (runner’s knee) which generally only bothers me when I wear my running shoes too long. Unfortunately all of the walking and climbing up stairs and towers and hiking that I’d been doing in my lame Nikes for the past two weeks had finally caught up with me. Argh! We decided to take the gondola back to Zermatt versus hiking back down as going down is always harder than going up on sore joints and knees. That turned out to be a great choice as we were treated to a breathtaking view of Zermatt on the gondola ride. In the afternoon, we went to the English Church and visited the cemetery that has the graves of the climbers who didn’t survive their attempts and then went to the Matterhorn Museum which is a little kitschy but has a fascinating display about the history of the Matterhorn region, and includes a lot of info about the early climbers of the Matterhorn. We wrapped up the day with another great dinner (Chuck tried venison and I tried another sausage) and a visit to the hotel’s naked sauna (no swimsuits allowed but you could wrap yourself in a towel or bathrobe. It was wonderfully relaxing and happily empty (yes, I am an uptight American when it comes to naked saunas). 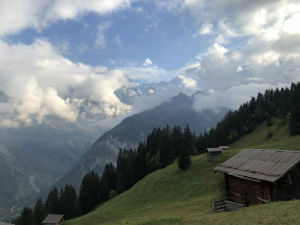 The next morning we left Zermatt for Murren, which is a small village in the Bernese Alps. Versus, you know, Zermatt which is in the Pennine Alps. Or Bled which in the Julian Alps. This ends your geography lesson for the day. That’s a wrap (of the Rick Steves Eastern Europe tour, anyway)!